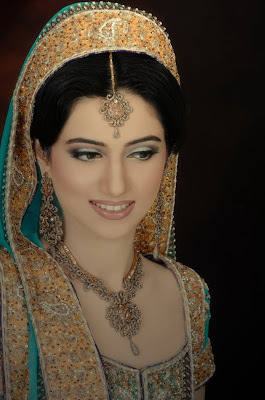 Fashion world latest Fashion: Bridal make-up fashion Pakistani trends. Light Bridal Make-up, making lips colour with suit colour like light lip stick colour and beautiful eye make-up. 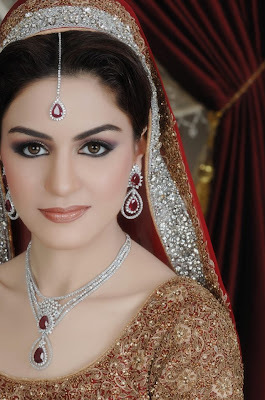 beautiful Pakistani Bridal make-up , it a dark party make up for brides, in this make style the lips colour is matching with the suit colour main focus of make is on lips and eyes, beautiful eyebrows style and nice liquid eye liner. For the makeover of the eyes glitters over the eyebrows are used to give a glowing look of the bride. A thin line of white eye-liner on the eyelid is used to highlight the eyes. Black mascara is used to highlight the bride's lashes. Eyebrows are brushed out to have a thorough look. Proper make-up is also applied to the forehead, nose and chin. To light up the eyes, many brides opt for an eyelash perm, which lasts about 9 weeks but using eye shadow primer, then applying a neutral shadow over the eye and prepping the eyelids with a little face powder can gain an equally lush effect. An off-white pencil lining the inside of the lower rims of the eyes can brighten them up. Double coat of waterproof mascara is the final touch for the eyes. Light wearing foundation with a dusting of face powder over it sets the make-up in well and to live up to the tag of a blushing bride, one is advised to go in for a powder blush-on, which is longer lasting than the creamy counterparts. 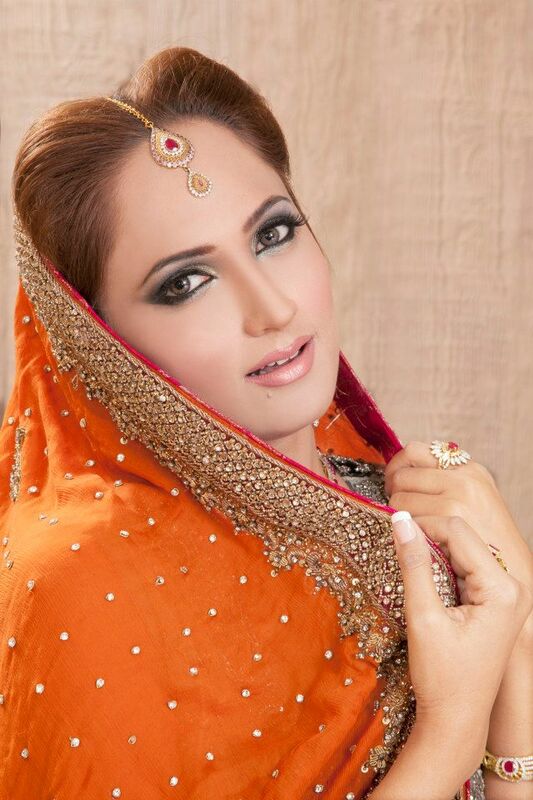 Labels: Bridal make-up fashion Pakistani trends.